The house is extremely well equipped. It has 6 rooms, including 1 suite, 4 bedrooms with large double beds and one room with two single beds, served by two more bathrooms. It has a large living room with accommodation for all who give directly to an outside area where you can dine outdoors. Modern dining room. 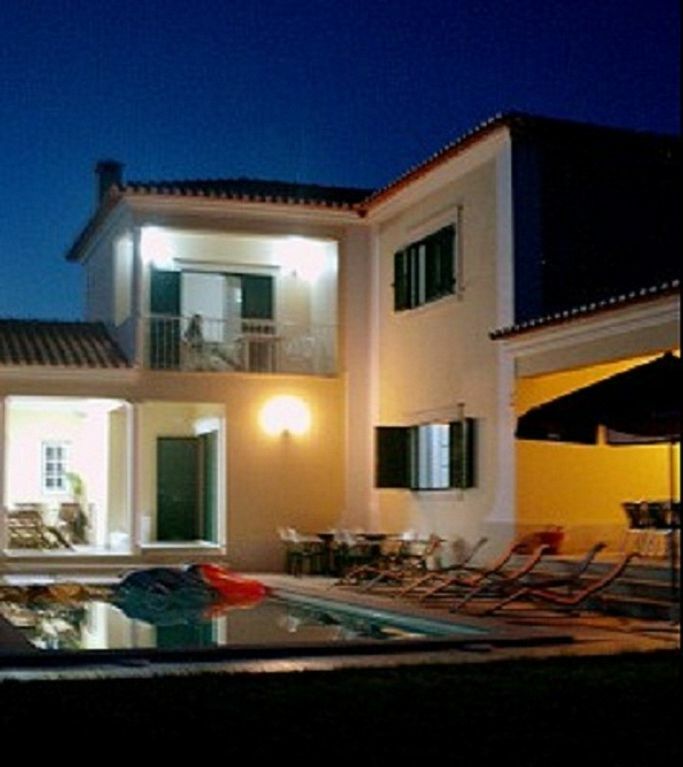 The common areas and four bedrooms enjoy an excellent view of the garden, sea and mountains. The house is surrounded by a pleasant garden where it operates the pool with garden equipment, tables, chairs, loungers and 1 bathroom to support this area. The kitchen is modern and fully equipped. The laundry has washing and drying machine and iron and ironing board. There is also a games room and garage. The property has four full bathrooms, two with whirlpool tubs. Place to spend your family vacation! Beautiful property- Caring family owner! Sr. Antonio is an amazing gentleman. Thank my family had a great time. A week was too short!!! The house was more than we expected! The house was really beautiful and there were everything you need on vacation; lovely big pool, big luxury rooms for families and friends; 6 bedrooms and luxury 3 bathrooms and lot's of dishes, wineglasses, game room for the children, bicycles which you could loan etc. The owner was really helpfull and friendly and lived 2 km away from the house and visited the house when we needed. We were a group of 3 families, alltogether 13 people, children and adults and in the house was plenty of space for us all. The interior was clean and really beautiful and tasteful. The house is in little guiet village Azenhas do Mar, within 500 meters there is 3 good restaurants and 1 grocery shop and a butcher. Nearest beach Praia das Macas was 1 km from the house and we went there by walking almost every day, but you can get there also with a buss 441, which leaves in front of the grocery shop 200 meters from the house. The buss goes also to Praia Grande 3 km from the house and via Colares to Sintra. From Colares goes another buss to Cascais beach and old town. We went everywhere by public buss, but taxis were also quite cheap, especially for 4 people taxi cost less than 4 people in the buss to Praia Grande. We were really satisfied and happy about the house, ocean view from the terrace, the village, public transports and near beaches and Sintra old town. We all can highly recommend this house for groups of families and friends and we want to thank again the owner from everything, we really enjoyed being there! Beautiful house, everything you need. I stayed in this house as part of a group of 10 people for 1 week. We are all in our 20s and were looking for a place to relax and enjoy ourselves. This house was perfect for that. It was really big and spacious, the three bedrooms upstairs are really big and luxurious. The reception rooms are really spacious, the kitchen is a great size and the outside space is perfect for 10 people or more. The pool looks small in the photos, but it's actually a really good size. The pictures definitely do not do the house justice, it's a great house for a family or a group of friends. The house was really clean and had absolutely everything we needed, we cooked every night and ate outside, having barbeques as well.The owner Antonio was really friendly and very helpful with any requests we had. The location is great for a quiet holiday. There are a few really good restaurants in walking distance, one is called Pat's and its really good food, really cheap and a 30 second walk away. There are 2 good local shops really nearby, with everything you need. The town of Praia do Macas is about a 15 to 20 minute walk away. Our group found that the house had everything we needed for a relaxing holiday and most days we just stayed by the pool and enjoyed the house and surrounding. I would definitely recommend this to friends and families. Had an amazing time at the villa. Mr Costa did all he could to help with any requests we had and we had plenty. Parts of the villa could do with some maintenance but it certainly didnt and wouldn't put me off recommending this villa to anyone. There was plenty of space for all of us (11 ) the local bar and shops had everything we needed. Fantastic time had by all, now to find our next venture. We had a good time during or stay in Lissabon. The location was good, near by the sea and there where two small supermarket. The house was very good, a lot of space and kitchen gear. Only the the heating didn't work. We had a great time and very thing was very good organized. Apresentamos preços para uma ocupação máxima de 10 pessoas.Os preços incluem,acesso gratuito à internet, lençóis e toalhas. Para estadias de mais de uma semana está incluido no preço 1 limpeza semanal com mudança de roupa da cama e de toalhas. Limpeza diária também está disponível a um custo extra. Caso a casa no final se encontre com lixo e sujidade extra, serão retirados 100,00 € da caução.